Stalin’s death in 1953 led to unrest in several states of the Soviet Empire, as their hungry, tyrannized peoples sensed a slackening in the grip of the hard-line regimes. 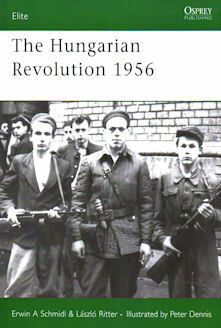 This is an account of the October 1956 student demonstations in Budapest, which attracted growing support from workers and, when the secret police opened fire, from many Hungarian troops. For five days they successfully fought off Soviet tanks, and it even seemed that Moscow might negotiate a withdrawal; but then the tanks rolled in again, in crushing numbers. This stirring story is illustrated with fascinating contemporary photos and meticulously researched colour plates. "...gives a thorough and evenhanded summary of the causes and consequences of the uprising... lists ample sources for further study, while presenting a wealth of archival photographs... as well as an excellent spread of color illustrations by English artist Peter Dennis." "The authors have done a superlative job of not only explaining the background for the revolution, but also in providing a description of the fighting and its surroundings... As with most of the Elite series, there are superb drawings, this time by Peter Dennis, showing the various clothing and equipment of the people involved."